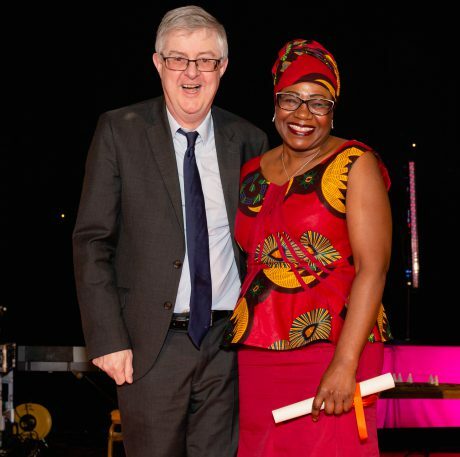 Humie Webbe and First Minister, Mark Drakeford, at the EMWWAA (Ethnic Minority Welsh Women Achievement Association) ceremony at City Hall in Cardiff. 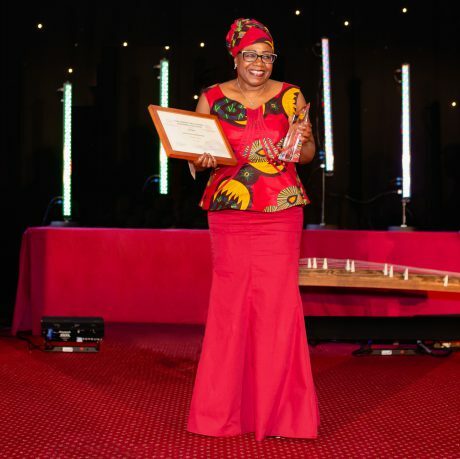 Equality and diversity campaigner Humie Webbe has spent her life dedicated to helping people from Black, Asian and Minority Ethnic (BAME) communities achieve a voice – and her tireless efforts have been recognised with two prestigious awards. At the Ethnic Minority Welsh Women Achievement Association (EMWWAA) Awards Humie was honoured for her outstanding work and commitment to promoting and inspiring people in BAME communities in Wales. As the strategic equality and diversity lead at the National Training Federation for Wales (NTfW), Humie encourages and engages with people BAME communities and those with disabilities across Wales to promote the opportunities afforded by apprenticeships. Previously national diversity coordinator for Mind Cymru’s Time to Change Wales campaign, Cardiff-based Humie has spent nearly 30 years working the public and community sector championing disadvantaged groups. A founding member of Black History Month Wales alongside late celebrated Cardiff headteacher, Betty Campbell; Humie has been named among the most influential African Caribbean and African Welsh people, and in 2000 was included in the Western Mail’s power list of 1,000 most influential people in Wales. Working with a cross-section of public bodies, organisations, education and community groups, Humie uses her wealth of experience and extensive contacts to bring people together to create more awareness and opportunities for people in BAME communities. She is passionate about expanding people’s horizons and promoting training and career pathways for people in BAME communities in Wales. Also, as a mentor with the EYST Wales (Ethnic Minorities & Youth Support Team) engagement programme, she is helping people develop political skills and increase their impact in public life. Despite having held such important positions, and having been at the forefront of many initiatives that have helped change people’s lives, Humie is very modest about her contribution. “I’m not very confident in putting myself forward, because I just do what I do,” says Humie who was nominated for the EMWWAA awards by a colleague. On taking up her role two years ago with NTfW, Humie hit the ground running – organising events and using her considerable networking abilities to bring apprenticeships to a hitherto underrepresented audience. The enthusiasm she believes is there but is not necessarily matched by an awareness of the opportunities. In addition to jointly receiving the EMWWAA Social & Humanitarian Award Humie was named as the recipient of one of three EMWWAA Rhodri Morgan Ambassador Awards, which were presented in memory of the late First Minister. Humie received the award along-side Iolanda Banu Viegas and Shavannah Taj and said she intends to use it to further advance her work. part of ensuring that many unsung heroines from diverse minority ethnic backgrounds are discovered, recognised, nominated and celebrated. Professor Meena Upadhyaya, founder and chair of the EMWWAA said there had been a large number of entries from so many ‘exceptional individuals’ across Wales. “This year, the judges chose to honour Humie Webbe, Iolanda Banu Viegas and Shavannah Taj, and we look forward to them as ambassadors continuing to discover and showcase women from Wales, who are unsung heroines.